What strength ND filter should I get? That answer depends on the situation and most will find one single-density ND filter to be inadequate. Covering every density, even every full-stop density, requires a significant number of filters and the issue is compounded when multiple sizes are needed or multiple filters are simultaneously needed such as when operating multiple cameras. That is the big value that variable ND filters provide. With a single filter, a wide range of densities can be covered. What is a Variable Neutral Density (VND) Filter? 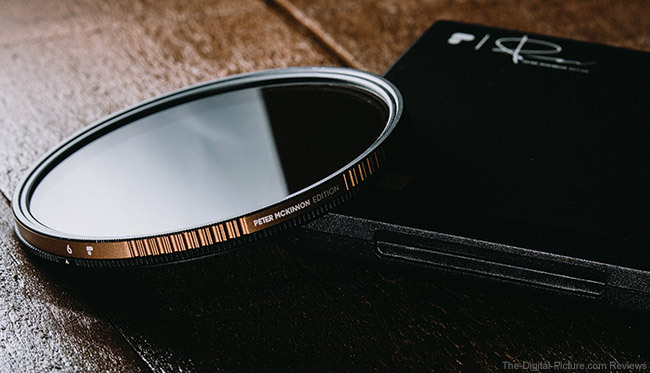 At a high level, a variable neutral density filter is a neutral density filter with a density variability feature added and before reading further into this review, it is important to know what a neutral density (ND) filter is along with why you need/want one (or many). The neutral density (ND) filter review explains those reasons and provides the need-to-know information. With very dark densities available in VND filters, the 10 Stop Neutral Density Filter Review is also applicable. In summary, ND filters prevent a (hopefully) even, designated amount of all visible wavelengths of light from reaching your camera's imaging sensor. Preventing light from reaching the imaging sensor may seem counterintuitive, especially when spending large amounts of money for wide aperture lenses, but these filters have a solid place in many kits. Use ND filters to extend your exposure times. Use the extended exposure time to allow the use of a wider aperture, such as when bright daylight requires faster-than 1/4000 or 1/8000 second camera-limit shutter speeds in bright daylight or when needing a slow shutter speed for video capture. Also very common is to need to use the longer exposures to add motion blur to an image. Blur moving water to show motion, create cloud streaks in the sky for effect and to indicate the passing of time, and help in-motion subjects such as people to disappear from the image. This review expands upon the ND filter review, primarily discussing the advantages and disadvantages of the variable ND filter type along with a close look at the premium PolarPro Variable ND filters that initiated this review. Basically, Variable ND filters are stacked polarizers with the orientation relationship between the two creating the variability in density. In more detail, the PolarPro VND is comprised of quarter wave plates in front of and behind a pair of circular polarizer filters. The front quarter wave plate ensures that the first polarizer sees a non-polarized scene. The outer polarizer rotates in relation to the fixed inner polarizer, allowing the amount of light transmission to be adjusted. The rear quarter wave plate again alters the polarization state of the light waves, ensuring that the camera is presented with a non-polarized image avoiding issues that such can create. 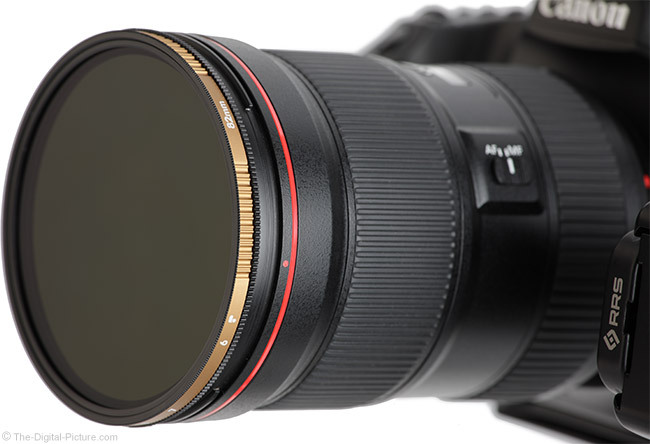 What are the Advantages and Disadvantages of Variable Neutral Density (VND) Filters? This story starts long ago with a high-end, quality-brand-name variable ND filter joining my kit. I was drawn to the convenience of having a wide range of filter densities immediately available in a single filter, making density changes very fast. It was great to be able to adjust the density to a low amount to make composing and focusing possible and a simple turn of the ring would darken the filter again. As a zoom lens can eliminate the need for carrying multiple primes lenses (max aperture not factored in), a VND filter can eliminate the need for carrying multiple ND filters and eliminating the "Which ND filters should I take?" question. Similarly, all of the in-between settings are covered (an especially valuable feature for video) and less space in the pack is consumed. Also similar is that while a VND filter costs more than an equivalent-quality fixed-density filter, you will likely find it costing less than the multiple ND filters otherwise required. With fewer filter changes, drops and other mistakes are less likely and inclement weather is easier to deal with. Rapidly changing light conditions, including a setting sun, are much easier to adjust to with a VND filter vs. a set of ND filters. After using my new VND filter a few times, I quickly gained a distaste for it and it was soon eliminated from my kit. Why? One major problem was the rim thickness. Polarizer filters are relatively thick and stacked polarizers are even thicker. The rim thickness on my original filter, despite it being a "slim" model, led to mechanical vignetting at even moderately wide-angles (roughly 40mm). As I use ND filters at wide-angles more frequently than at longer focal lengths, that was a significant problem. The corners either had to be reconstructed during post-processing or they had to be cropped out. Cropping either created a new aspect ratio or reduced the image size enough that it should have been captured with a longer focal length in the first place. The other major issue I experienced was a cross-polarization or cross-hatching pattern being seen in wide-angle images captured with strong densities dialed in. When this effect becomes strong, most will not be happy with the results, as seen below, captured by a cheap, lower-grade VariND filter. The above example was captured using the Canon EF 17-40mm f/4L USM Lens at 19mm f/5.6 and just to reiterate, this example was not captured by the filters being reviewed here. Whenever blocking light for typical ND purposes, it is important to block all wavelengths equally, avoiding color shift. 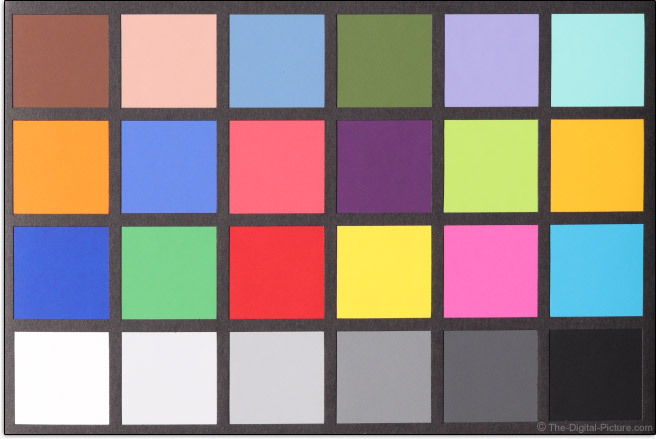 Higher grade filters generally have less color shift than lower grade options. The cross-polarization example above was processed using daylight white balance and obviously shows some color shift. 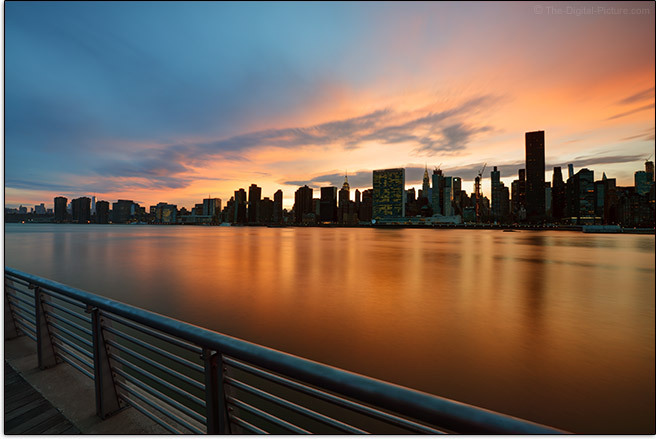 VND filters can create brightness unevenness, especially at wide-angles, and those effects can be a differentiator compared to single density ND filters. Note also that manual camera exposures should be used when a VND filter, especially one dialed to a dark setting, is mounted. After my initial VND experience, I happily moved on the standard single-density round ND filters. Based on experience, I was very reluctant to accept PolarPro's sponsored variable ND filter review offer. I suspected that I would spend a couple of days producing a review of a product that would not perform up to my requirements which would not lead to sales and, in the end, leave no-one happy. Well, no one except those who avoided a purchase mistake, of course. My PolarPro rep seemed undaunted about my reservations and I eventually accepted the assignment that included a pair of their not-yet-announced "Peter McKinnon Edition" Variable Neutral Density filters. The box arrived as expected and nothing seemed unusual until I picked it up – it seemed quite heavy. Upon opening the box, only the two filters were present, but the pair of retail filter boxes were very substantial. That was just the start and the entire PolarPro Variable ND filter unboxing experience was quite impressive. Slide off the box cover sleeve to find a presentation-grade case. Inside the case is the VND filter (of course), a magnetic-closure hard filter case with a metal top and bottom, a soft filter case, a "DefenderSlim" filter cover (lens cap) and a microfiber cloth. Of course, the filter is what matters most and it does not disappoint. The VND filter base is thin with a wide diameter that extends outward slightly beyond than the rest of the filter and the lens, making the filter very easy to install and remove despite the front portion rotating. 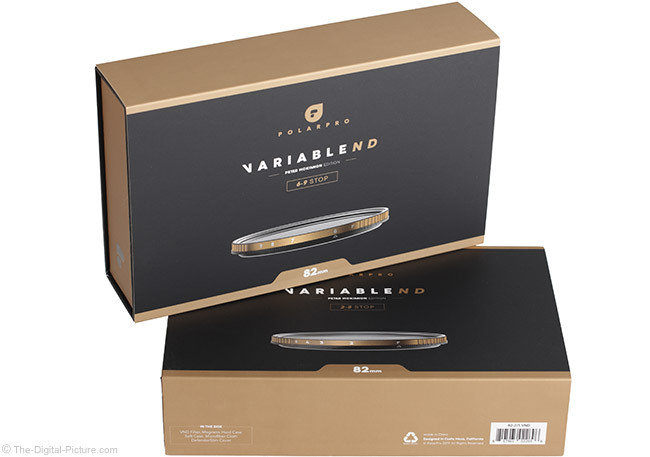 The filter features an aluminum ring with an easy-to-grip, smooth-rotating frontmost ring that was given a premium-appearing gold color. The rotating portion of the filter is also relatively wide in diameter, yet quite slim. That combination, as I will show you soon, avoids the vignetting problem I previously encountered. A downside to this design is that your lens hoods are unlikely to fit over the filter. Part of the slim design meant eliminating front filter threads and this means that your lens cap will definitely not clip on, meaning that a slip-on type of cap is needed. That is, of course, the reason for the "DefenderSlim" filter cover being included in the case. If you are like me, you are fearing this push-on (often-fall-off) type of cap. I don't recall using a slip-on cap that worked even reasonably well, but PolarPro came through on this one. The included rubberized slip-on cap is substantially-constructed with a rigid body and sides just flexible enough for a snug grip on the filter, holding over the back rim. The attractive-appearing topographic-map-inspired cover firmly fits over the filter, nicely stays in place, and is not hard to peel off of the filter during use. It's the best push-on-style lens cap I've used to date. The hard filter box is constructed of plastic with a brushed-metal outer top and bottom and the interior bottom has a rubberized tray. The magnetic closure works well. The filter cover on my 82mm filters creates a snug fit in the hard box provided – I would welcome an extra millimeter of additional interior space. The padded nylon soft case is relatively tall with an ideal width. It includes a sewn-in microfiber cloth and a hook-and-loop tab closure. Both cases conveniently include the filter size and model printed on them. The PolarPro "Peter McKinnon Edition" Variable Neutral Density filters are available in two density ranges, 2 to 5 stops and 6 to 9 stops. A large variety of variable ND filters are available and many contain most or even exceed the entire range of densities contained in both of PolarPro's filters. As fewer filters and increased convenience are foundational goals of VND filters, I had to ask "Why two filters?" PolarPro's response was: "By using two with clearly indicated stops on the bezel and having the range limited within those parameters, there is no chance for cross polarization which is important when adjusting quickly." That sounds like a good reason to me, potentially avoiding one of the big problems I experienced prior. Here are the PolarPro VND Filter specifications. If your lens' filter size is not covered, an inexpensive Step-Up Filter Adapter Ring will likely adapt your lens to one of the larger-sized filter threads available. Since the lens' hood is not likely to fit even with the proper-sized filter, buying a larger filter with step-up rings for the rest of the lenses in your kit can be a great idea. PolarPro backs these filters with a lifetime warranty. Note that all of the test images in this review have been custom white balanced using a pro-grade reference captured with the "Control" setup for the lens being used. How Do the PolarPro Variable Neutral Density (VND) Filters Perform? The short story is that I'm surprised and impressed at how well the PolarPro VND filters perform. They are not perfect from an imaging standpoint, but considerably better than I expected. I got a little carried away with testing these filters, so I'll try to filter (pun intended) the results down to what seems a concise quantity. Starting with an easy test, I set up the vignetting diffusion glass and continuous light in the studio and mounted a Canon EF 16-35mm f/2.8L III USM Lens to a Canon EOS 5Ds R. While the camera matters little in this test, the lens matters a lot. In general, an ultra-wide-angle focal length with a wide aperture is more apt to show mechanical vignetting caused by a thick filter ring than longer focal lengths and narrower apertures. For this test, a manual exposure was used at 16mm f/2.8 (for maximum vignetting) and the shutter speed was adjusted based on the settings marked on the filter. The control image (no filter) is shown on the top-left with the marked stops (2 through 9) being shown in a left-to-right, top-down sequence following (the same layout will be featured in additional examples later in the review). 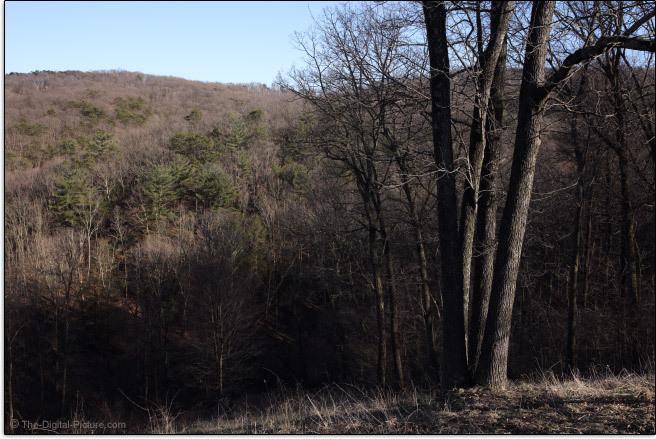 The results of this specific test show that these filters impart essentially no hard vignetting at any setting. Based on my prior experience, that is a big deal. Ultra-wide-angles and wide apertures can be used and can be used simultaneously if desired. The next attribute to share from these results is color shift. With all images sharing the same white balance (based on the control image), the color differences can be attributed to the filtration. Blocking all wavelengths of light evenly is a big challenge for ND filter designers and in this case, we see the 2-5 stop filter showing a slight blue deficit (R,G,B = 177,178,167 for example) and the stronger 6-9 stop filter results looking very impressive, being nearly perfectly neutrally balanced. Typical for variable ND filters is for the filter ring to be marked with "Min" and "Max" along with a series of dots between the full-extent marks. You are left to discern what the actual density settings are. Extremely helpful is that PolarPro has included specific density numbers laser-etched onto these filters. The amount of light being blocked can be directly dialed in with exposure settings being easy to calculate. The above test results were exposed with the expectation that the marked settings were correct and most are very accurate with the strongest settings perhaps appearing slightly weaker than their marks. Looking closer at color and exposure is the next set of test results, captured outdoors under a clear sky. This subject is an X-Rite ColorChecker and the Canon EF 24-70mm f/2.8L II USM Lens (at 70mm, f/5.6) was mounted to the 5Ds R for this set. These images are cropped and reduced and are also useful for judging color shift. These colors appear very good to me. Note that I included a "1.5" result despite the brighter filter having a rating that starts at 2 stops. There is non-specified PolarPro logo mark below the 2 setting that seems to perform approximately as a 1.5-stop ND filter. 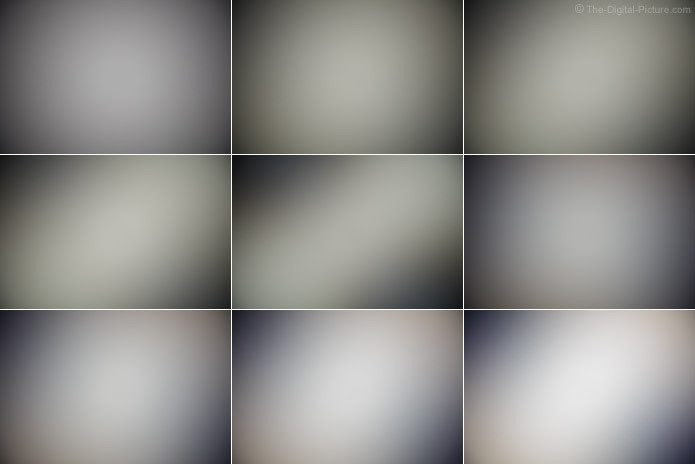 I attempted to capture the above images with exposures being matched in-camera (with no exposure adjustments made during post-processing). The results are very close, though not quite perfect. Here are the settings used to capture each. So, with the exception of the darkest settings, the specified stop marks are properly calibrated and as mentioned, extremely advantageous to have. While the 1.5 stop setting is a bonus, the 9-stop setting does not appear to reach its mark. Obviously, the diffusion glass images shared earlier are not evenly illuminated. 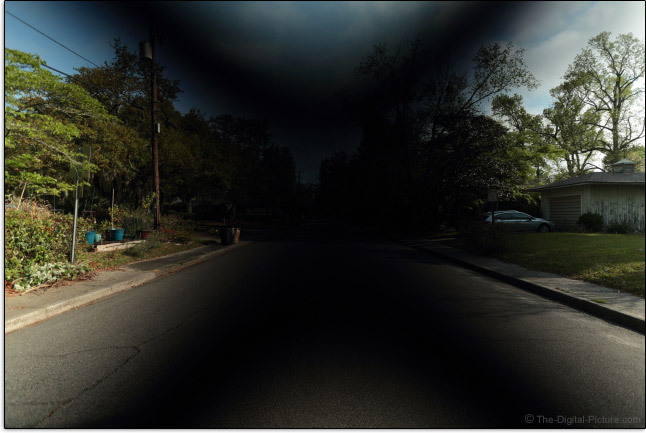 The results were captured with a lens, focal length and aperture combination that has a strong amount of native vignetting (well over 4-stops), so they should not be expected to have an even brightness. However, the change from the control shows the filters imparting their mark on the ultra-wide-angle results in regards to even illumination. Unevenness caused by VND filters is readily visible in significantly size-reduced images containing an evenly-colored subject and accentuated by the wide-angle. 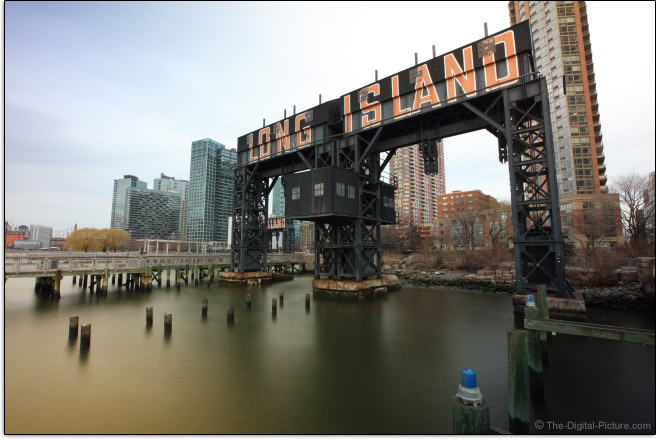 Below are reduced images captured with the Canon EF 24-70mm f/2.8L II USM Lens at 24mm f/5.6. Look carefully at the control image before creating opinions about the other results. 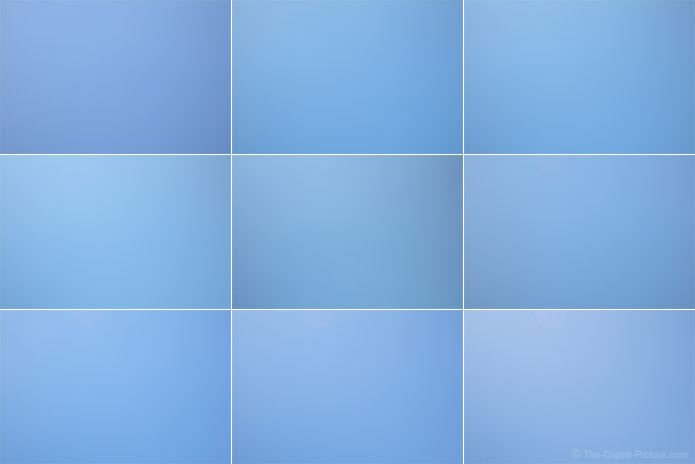 The sky has some natural gradient that must be taken into consideration. Once again, we see the 2-5 stop filter having a slight blue channel deficit, but the evenness shown over the entire range of stops is quite good – a great performance for a VND. Mount the Canon EF 24-70mm f/2.8L II USM Lens, set the focal length to 70mm and open the aperture to f/8 and very little unevenness is present. 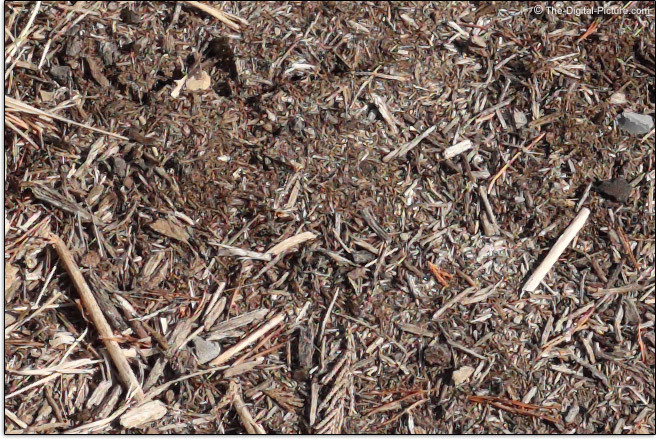 As seen in the scene below, detail can hide any unevenness. These images were captured at 35mm. Add some lens elements and filtration to the front of the lens and image sharpness could be affected. Below are 100% sample crops captured with the 16-35 L III and EOS 5Ds R at f/5.6 and adjusted for near-equal brightness. 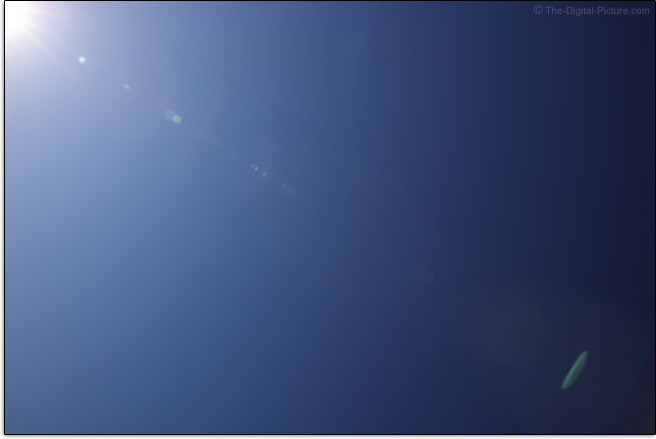 Note that, even under such bright conditions, the long exposures created by a 9-stop filter are sufficient for heat wave impact even at a short subject distance. If these filters are negatively impacting sharpness, it is by a negligible amount. Add some lens elements to the front of the lens and increased flare can be expected. We'll look into this aspect next with a set of 24mm, f/16 test results. Note that the flare differences between density settings within each filter were very minor and not worth sharing. The lower density filter shows a minor amount of increased flare and the higher density filter shows a bit more. From a relative standpoint, the additional flare effects are not a decision factor in my choice to use the filters. A common use for VND filters is landscape photography, especially with moving water and/or clouds in the composition. Being early spring, the landscape that goes with moving water and clouds was looking rather bleak here. So, that seemed a good reason to head into New York City for a couple of days of shooting cityscapes. Here we are at the docks in Gantry Plaza State Park, Queens on a cloudy afternoon for a set of real-world examples captured at 16mm f/11 ("Cloudy" white balance selected). Deciding which version was my favorite was not difficult in this comparison. I'll take the 9-stop version. Looked at individually, the PolarPro VND filters are rather expensive. However, if the cost of even a few of the individual ND filters being replaced is considered, the PolarPro VNDs are a very good value. 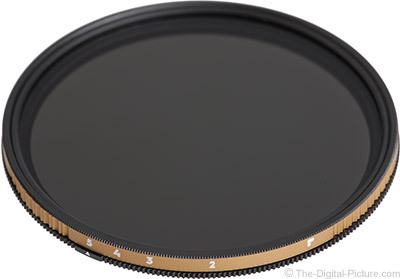 There are inexpensive VND filters available and those make the PolarPro filters appear expensive. However, if the performance of the cheap filters is compared to the PolarPro filters, the value of the more expensive filter will become clear. As mentioned, this was a sponsored review. It was also completely honest and hopefully, that is transparent in the description and test results shared. Variable neutral density filters bring convenience and efficiency similar to a zoom lens vs. a prime lens to neutral density filters. VNDs bring some disadvantages with them including unevenness in a wide-angle image. However, the PolarPro Variable Neutral Density (VND) Filters avoid a significant amount of the classic VND issues. Their impressive performance, quality construction, attractive design and marked filter densities make them a stand-out in the variable neutral density filter market.